Hope you all had a lovely weekend filled with lots of good food and good company! 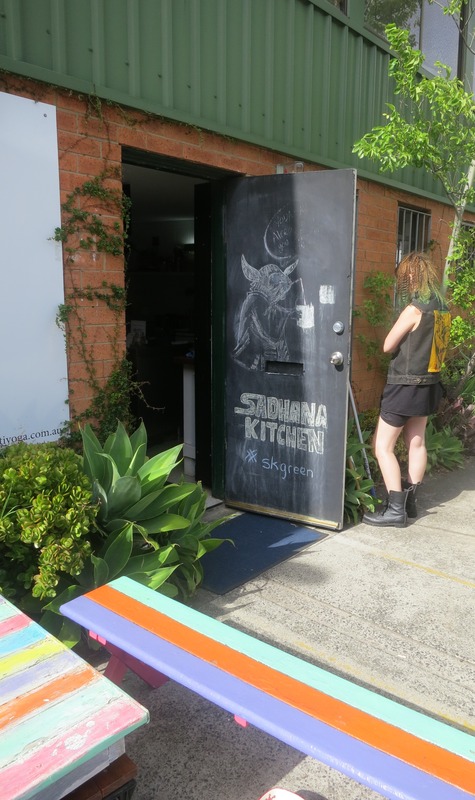 I thought I would share with you my visit to Sadhana Kitchen. 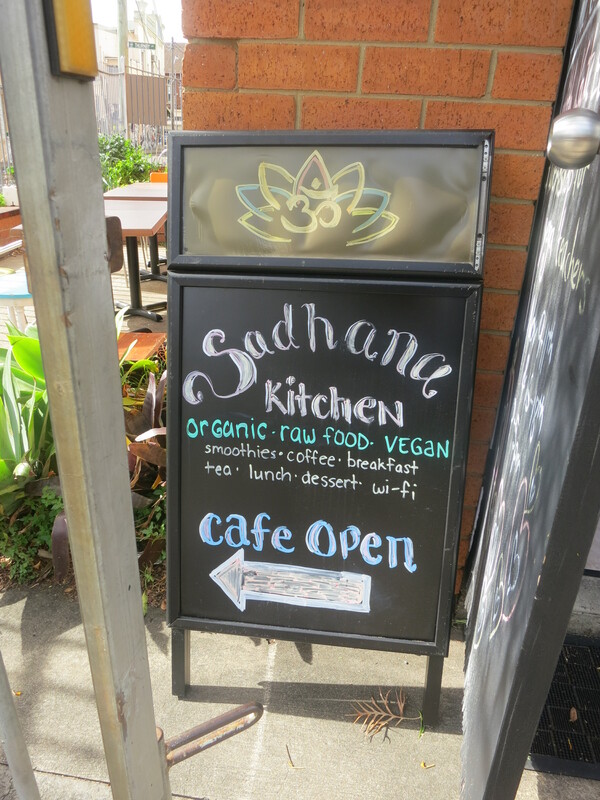 I have been wanting to go to Sadhana Kitchen for a while now after hearing about this place from friends and seeing blog posts of people’s visits to this vegan cafe. 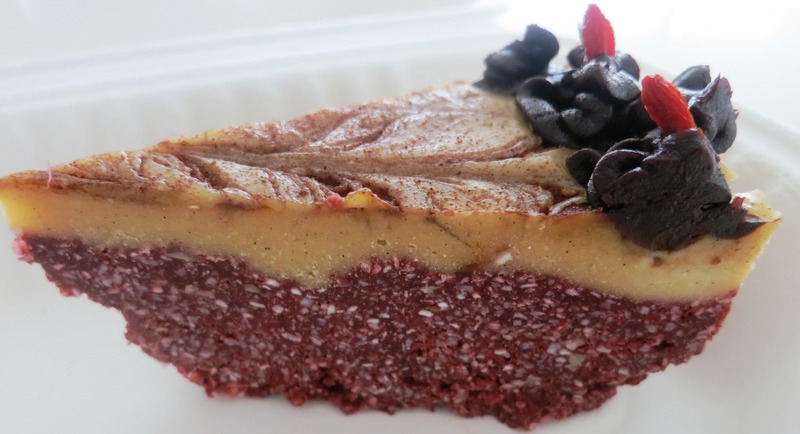 Before going to there, I had already stalked the Facebook page of Sadhana Kitchen to see what their cake special would be for this weekend as I intended on buying some cakes to try. Sadhana Kitchen usually post up pics of their various cakes (which are guilt-free) on offer for the weekend and I usually spend time staring at their amazing creations and hoping that I can eventually taste one of these cakes. 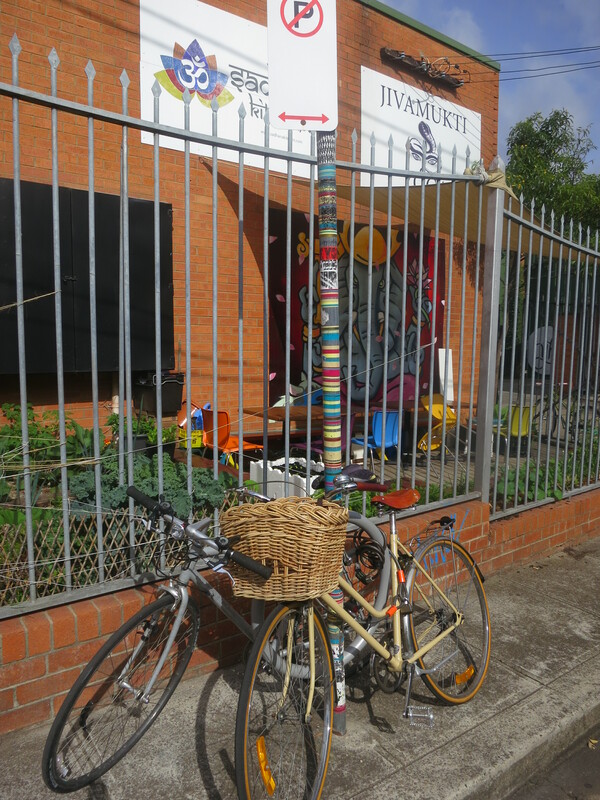 I was in luck this weekend when I had a bit of time to drop by their cafe in Newtown. I had seen on their Facebook page that they were selling an “After Dinner Mint Cake” which I knew I wanted to try. 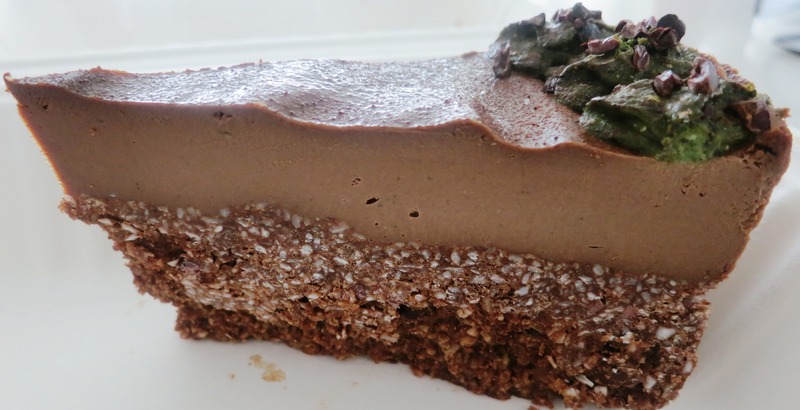 I love all things mint and all things dark chocolate so I couldn’t resist the urge to try this cake along with a few other cakes. 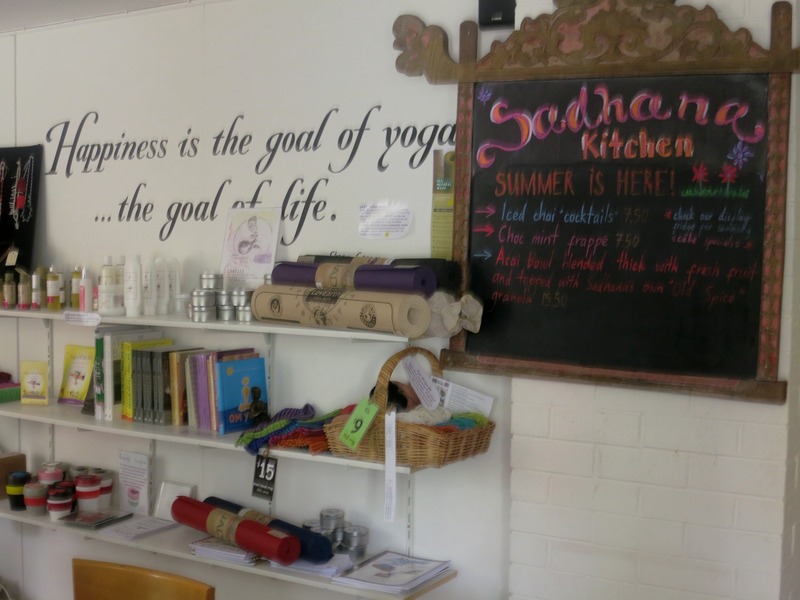 Sadhana Kitchen is a small cafe next to a Yoga Studio in Newtown. 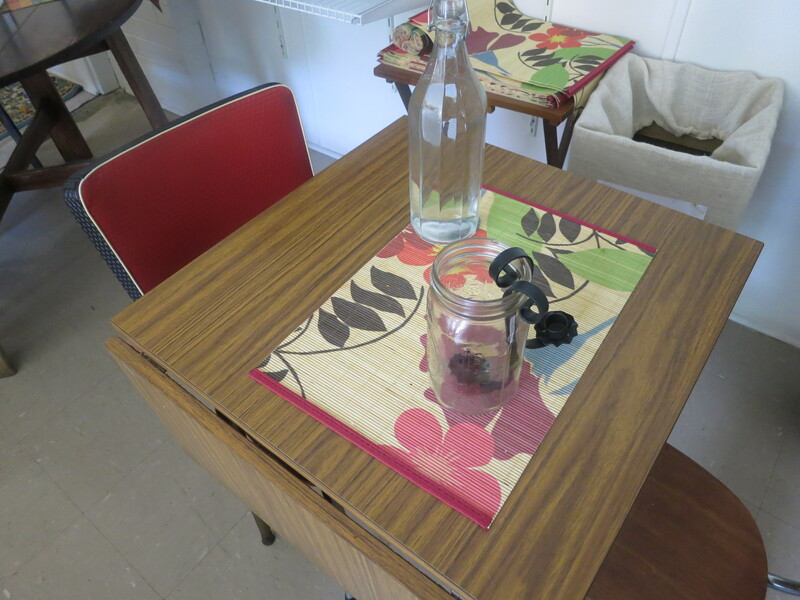 It’s one of those places where if you blink you might miss it. 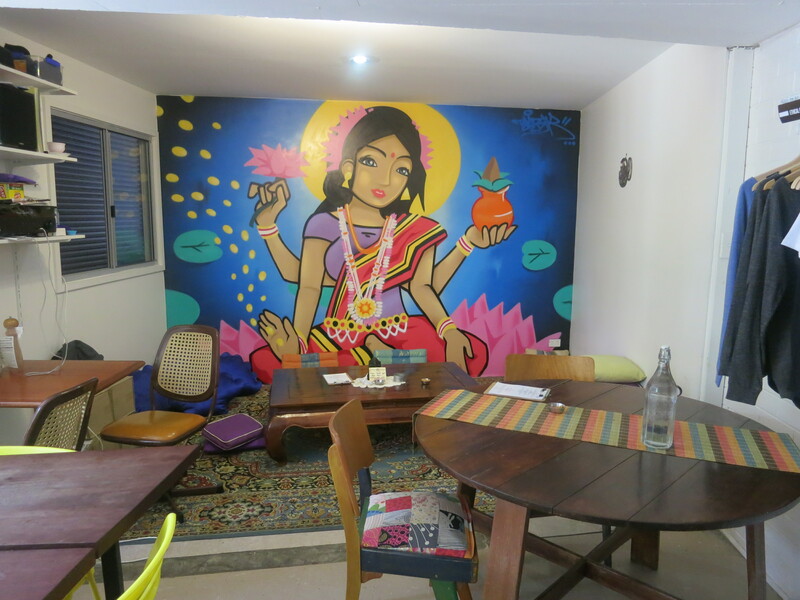 The thing that sets this cafe apart if it’s quirky and funky vibe that it emanates with paintings and graffiti outside and inside the building. 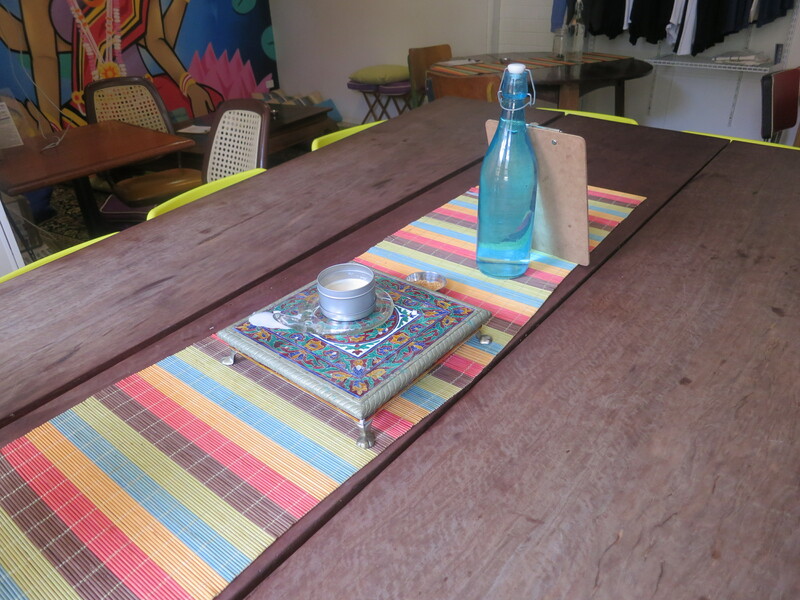 The cafe itself has a very cozy feeling with a few tables inside which can be shared with others and a few tables and chairs outside the cafe if you want to enjoy the sun on a nice day. 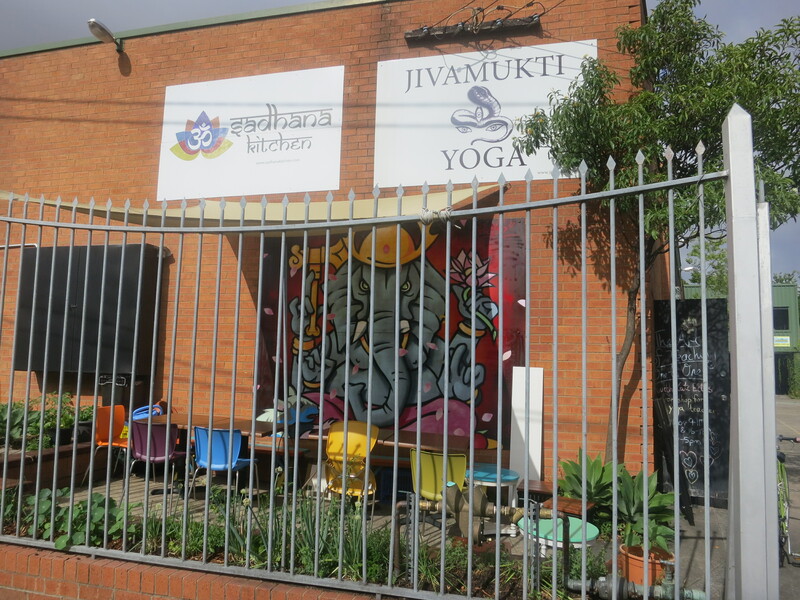 They offer a selection of breakfast items such as chia porridge, granola made of buckwheat, gogi berries, cacao nibs, crushed walnuts and shredded coconut, banana coconut pancakes and a seasonal fruit bowl. Lunch on the other hand provides very unique items of food such as their tacos served with walnut mince, a spinach and mushroom quiche, their own homemade lasagna using zucchini in place of the pasta and a superfood salad including home-grown sprouts, chia seeds, goji berries and hemp seeds. The focus of their food as you can see is on wholefoods and grains. Food that is easily digested and does not leave you feeling heavy and of course that is good for you and your body. On this occasion, as I had already eaten breakfast, I only managed to buy some cakes to take away. 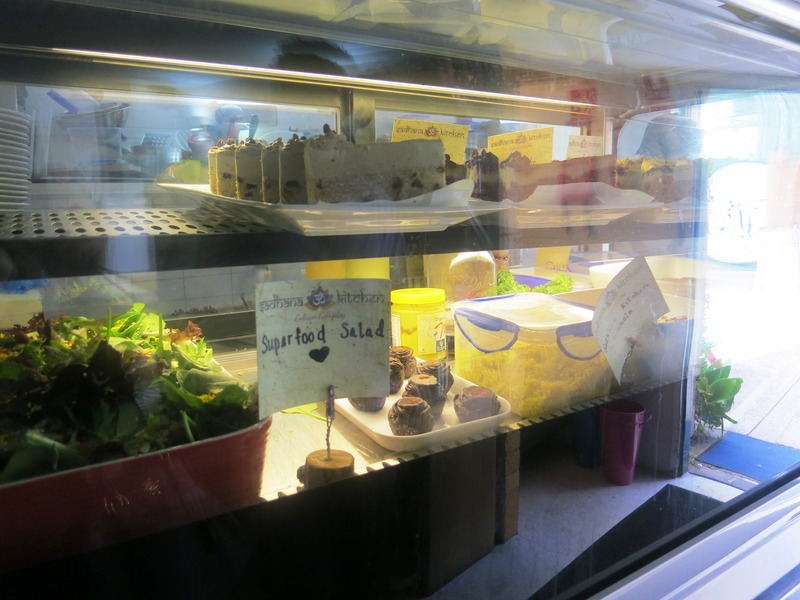 I will definitely be going back to this cafe to try out their zucchini lasagna and their banana coconut pancakes. 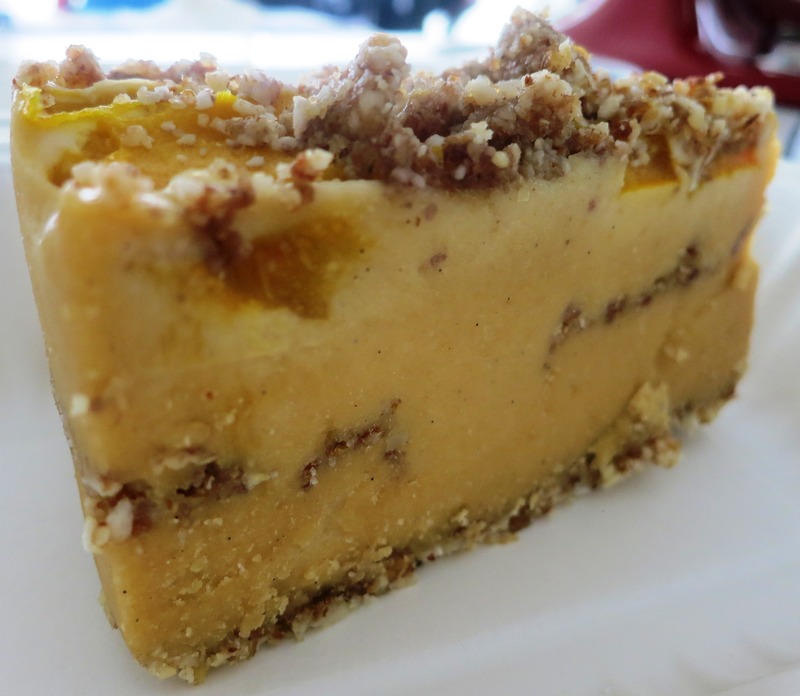 I found the cakes to be really nice in terms of flavours, textures and loved the combination of nuts and grains and healthy ingredients used in the cakes. The cake slices were generous portions as they are quite rich and decadent even if they are guilt free. The cake slices were rather expensive at around $11.00 for a cake slice but knowing that they have used good quality ingredients justifies the price tag. I really enjoyed this cake especially the top part of the cake. You could really taste the mint in the base of the cake which had been studded mint chocolate and coconut to provide a contrast in texture to the smooth chocolate top of the cake when eaten together. 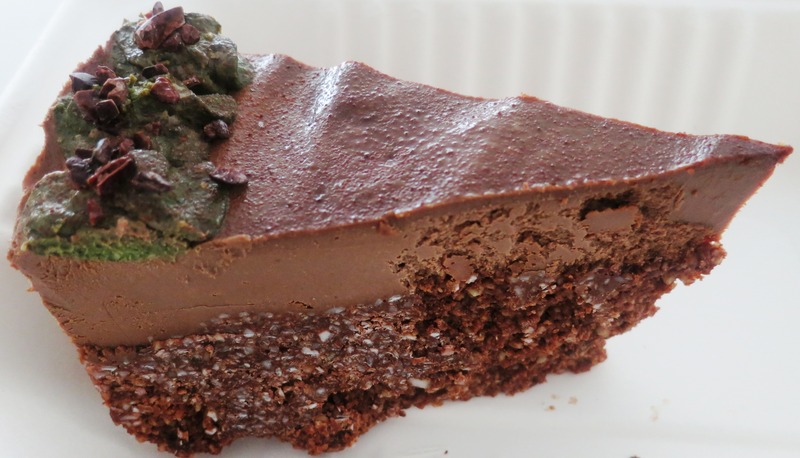 The cake is made with cacao nibs, chocolate mint, coconut and topped with a creamy chocolate mint topping. The base whilst having a nice crunchy texture, after a few spoonfuls was a bit much to eat. I ended up mainly picking from the top of the cake. It was quite addictive! This was my favourite cake and I would definitely go back to buy this cake again. I asked the waiter at the cafe what was the most popular cake they sell and he told me this was it and I understand now why it is. 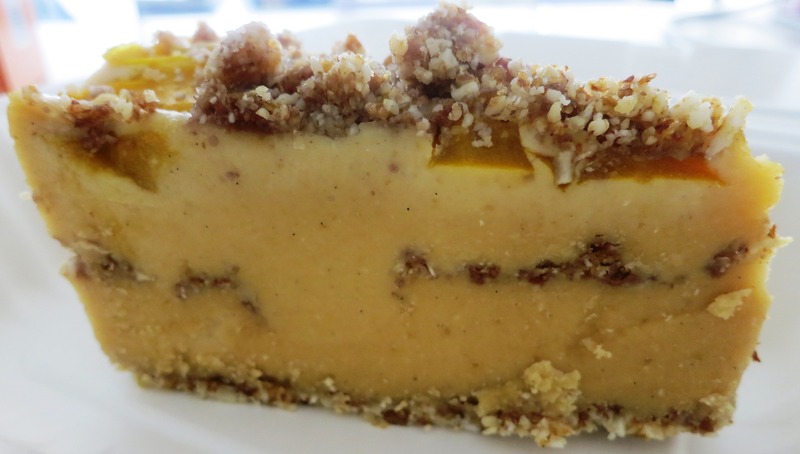 The cake is a mango cheesecake with a base and filling of nuts and coconut. The textures really worked well together and the cake itself was so smooth, light and airy. I couldn’t stop eating this cake. You could really taste the mango in this. As decadent as this cake was, it was really moreish and I just kept wanting to eat more but I refrained and left some cake to eat for later. 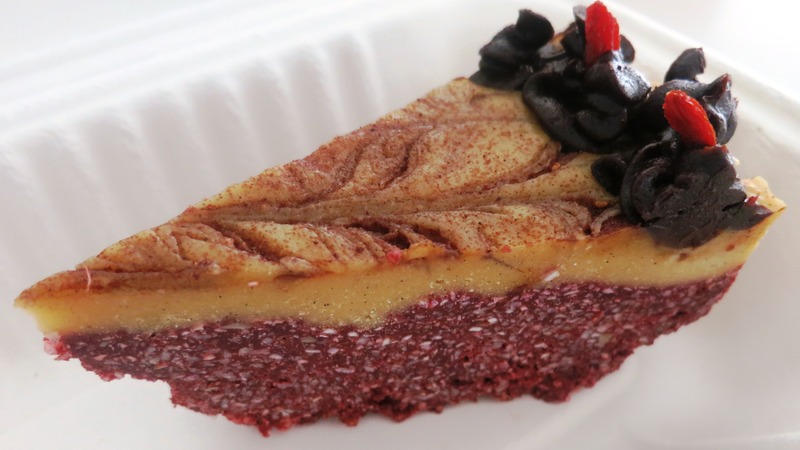 If you ever visit this cafe, you definitely need to order a slice of this cake!